So this is my first experience with Austria's Sergeant Steel. Take one look at the band photo below. You have three guesses to tell what kind of music they play, and the first two guesses don't count. You betcha. The bandanas give it away. This is classic Eighties Sunset Boulevard melodic sleaze hard rock akin to Motley Crue, Slaughter, or you name your hair band poison. Get it? Hair band Poison. Besides your giant forehead covering bandana, don't forget your hair spray and Spandex. Except for the round pasty-faced bass player. He gets out his best gay cowboy clown outfit. Jesting and sarcasm. Okay, jesting aside. Well, maybe more jesting later. From press material it seems that the core of this band revolves around Jack Power who writes all the songs and plays, like, fifty different instruments. Well, maybe not fifty, but a lot. Told you there would be more jesting. Actually, he does most everything like electric, acoustic and dobro guitars, backing vocals, keyboards, percussions, orchestration, programming, congas, jews harp, tablas, electric & acoustic sitar, flutes, salor. What the hell is a salor? Did I say he also produces? Well, of course, he does. You get a sense of where the band is coming from in the first four songs. Happy Time and Dirty Habits have the metal-edged swagger of sleaze glam hard rock. Silver Spoon brings out the AOR melodic rock side common of the genre, with a softer side and nice harmonies. Where My Heart Is is the classic Eighties ballad. But there's other songs of interest. 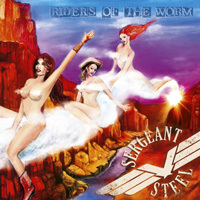 Sergeant Steel accurately captures the punk roots of the gutter glam sound with the fast and rowdy Only Good Girls Love A Rock n Roll Boy (really?). Additionally, vocalist Phil Vanderkill has a good command of the snotty punk sneer that infused most all the vocals back in the day. Can't Take My Hands is a good example of his best. A return to the ballad comes again with Promised Land. Even quieter than Where My Heart Is, it moves upon faux symphonic notes and acoustic guitar. All in all, with Riders Of The Worm (what does that hell is that anyway? ), Sergeant Steel gets it. 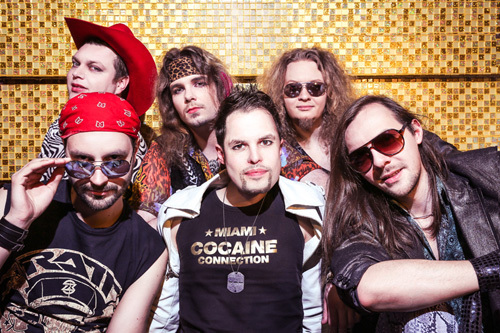 They're the quintessential "throwback Thursday" Eighties melodic sleaze hard rock band. If you like that stuff. Recommended. All in all, with Riders Of The Worm (what does that mean anyway? ), Sergeant Steel gets it. They're the quintessential "throwback Thursday" Eighties melodic sleaze hard rock band. If you like that stuff.